In an attempt to drum up public support for its fight with the Left Front in Kerala, the BJP’s Delhi unit has in the heart of the national capital placed grisly photographs of political killings in the southern state. The banners, some of which carry ‘hashtags’ such as ‘CPMTablibanism’, contain color photographs of the dismembered bodies of BJP workers, sometimes juxtaposed with the photograph of Kerala chief minister Pinarayi Vijayan. The move is unprecedented, especially for a ruling party. Such posters are considered too macabre to be used in Kerala by either of the ‘fighting fronts’ — the RSS-BJP front, the Left front or the Muslim League — and never used for public campaigning. The Kerala government had taken out front page advertisements in national dailies several weeks ago comparing crime statistics of Kerala with BJP ruled states after media outlets, such as the Republic TV, repeatedly highlighted the ‘lawlessness’ in the state. In Northern Kerala, each of the three political outfits often see their disagreements spill over into bloody fights. The attacks and counter-attacks, often involving swords, trace back their history to the martial tradition of the area, where local landlords used to settle their disputes by hiring ‘Chekavars’ or martial swordsmen to fight each other to the death on a public stage. The area was home to ‘vettu kalari’ — literally hacking schools — till the 1960s. These were traditional martial schools where ‘students’ were taught the art of hacking others to death. Because of the use of swords and knives, the results of such encounters are particularly gory, and such photographs are not usually used in public posters in the state. Nearly all the fighters — whether on the RSS side or the CPI-M side — come from the Thiyya (Ezhava) community. The move by the Delhi BJP comes in the wake of attempts by the saffron outfit to increase its base in Kerala, and raise the issue of political violence in the mainstream and social media. Last week, as part of the ‘Jan Raksha Yatra’, BJP President Amit Shah alleged that such violence takes place only when the Left Front government is in power, a charge denied by the Left parties. 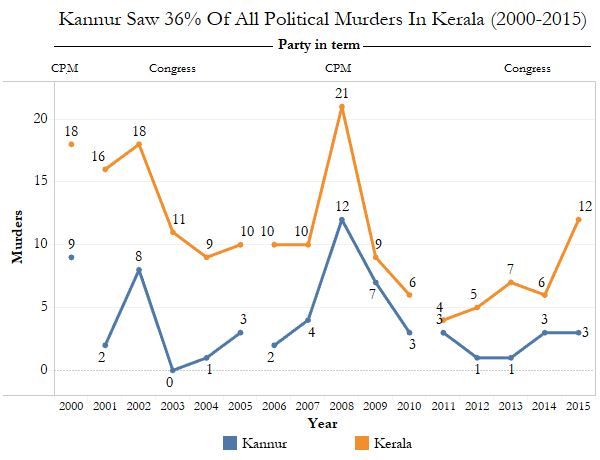 In the first five years between 2001 and 2005 — when the Congress was in power — there were 64 political killings in the state. In the next five years, when the Left was in power, there were 56 political killings. In the final five years — when the Congress ruled — there were 44 such murders. Within Kannur district — where the BJP is strongest — there have been 69 killings since 2000. Out of these, 31 victims belonged to the BJP and 30 belonged to the CPIM, with the remaining belonging to other outfits. Between February 2016 and July 2017, there have been 14 political murders, including those of 4 CPIM workers and 10 RSS workers in the state. While it is mostly RSS-CPIM fights in Kannur, the Indian Union Muslim League becomes a key player in adjoining districts of Calicut and Malappuram.